Endorsed by champion shooter Jerry Miculek, Grip Kits are easy to install and place the tip of your finger consistently on the trigger for better control and accuracy with every shot. Keeps your hand firmly seated on the grips and allows you to pull straight back on the trigger. 8- and 9- piece kits include five interchangeable trigger finger extenders to fit small and large hand sizes comfortably. Right-hand only. Mfg: Accuracy Grip Inc. SPECS: Molded polymer, black. 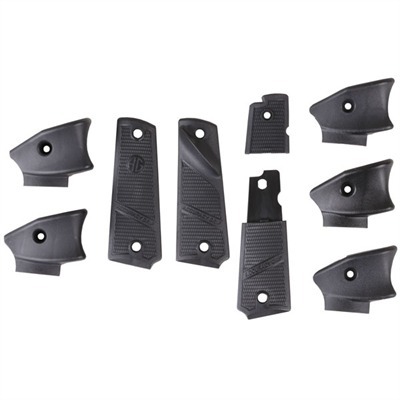 9-Piece Kit fits 1911 Government/Commander series large and medium frame pistols. 8-Piece Kit fits Colt 1911 Officers/Compact pistols.